Editor’s note: This was contributed by Sheji Ho, the Group Chief Marketing Officer at aCommerce, an end-to-end e-commerce enabler in Southeast Asia. Currently based in Bangkok but having previously worked in China, Sheji writes about e-commerce, tech, the internet, and how Southeast Asia is the next China. In his seminal presentation at DLD15, NYU professor and serial entrepreneur Scott Galloway coined the term “The Four Horsemen” to describe the four most dominant companies in digital that have a combined market cap of $1.3 trillion (2014). These companies are Amazon, Apple, Facebook, and Google. Galloway’s Four Horsemen theory assumes a Western-centric view; the moment we move east, we start to see different pockets of power, most notably in China, and increasingly in Southeast Asia – the following are these differences. China’s version of the Four Horsemen is called BAT, representing the three kingdoms in China – Baidu, Alibaba, and Tencent. Often considered the “Google of China”, the bulk of Baidu’s revenues come from search advertising. Unlike Google, Baidu has struggled to stay relevant in an environment that has rapidly shifted towards mobile and e-commerce. Discovery on mobile is increasingly favoring apps over search – ask yourself, do you find yourself searching less on mobile than on the desktop? And then there’s e-commerce. With the dominance of Alibaba, product searches are moving away from Baidu and straight onto Alibaba properties like Taobao and Tmall. The very same is happening to Google with over 55% of product searches now starting on Amazon and this is not even accounting for the damage Alexa aka Amazon’s next trojan horse may inflict on Google. Alibaba is the king of e-commerce, responsible for over 80% of online sales in China (B2C and C2C combined). Over the last 20 years, Jack Ma’s empire has grown into one that puts even Jeff Bezos to shame. With expansion and investments in areas like advertising, health, entertainment and transportation, Alibaba is more than e-commerce nowadays. Its digital advertising business last year surpassed Baidu to become the number one in China in terms of net digital ad revenue share (28.9% vs. 21.3%) and is estimated to reach 33.7% by 2018 (vs. Baidu’s 17.6%). Tencent, the biggest among the BATs in terms of market cap – $300 billion vs. Alibaba’s $288 and Baidu’s $60 billion, 2017 – is best known for its popular messaging app WeChat. Its main revenue sources are gaming and value added services like virtual goods, etc. The company has dabbled in e-commerce since the early 2000’s until it gave up on organic growth and took an investment in Alibaba’s competitor JD. Today, Tencent is JD’s biggest shareholder with 21.25% ownership, surpassing the 16.2% stake of JD Founder and CEO Richard Liu Qiangdong. With the global rise of on-demand and ride-sharing, China’s Didi Chuxing has cemented itself as the fourth horseman in China. The company is the result of a civil war between Didi Dache (backed by Tencent) and Kuaidi Dache (backed by Alibaba) and the newly merged entity subsequently assimilated Uber China to become the third most valuable private company globally, only trailing Uber ($68 billion) and Ant Financial ($60 billion). Didi’s recent funding round of $5.5 billion values the company at $50 billion and gives it the ammunition needed to expand internationally and invest in self-driving technology. With Baidu at risk of becoming the next Yahoo, many have looked at news reading app Toutiao to become one of the Four Horsemen in China. Launched in 2011, the company has benefitted from the mobile and vertical media wave in China to become one of the most prominent digital media properties in the country. Valued at $11 billion based on its recent $1 billion funding round, Toutiao is said to have 78 million daily active users and 175 million monthly active users with users spending an average 76 minutes on the app per day. The Southeast Asian tech space, despite being very nascent, has provided plenty of promising local successes to root for. There are Tokopedia and Go-Jek in Indonesia and of course Grab, Garena (which owns Shopee) and Lazada regionally. However, if we look beneath the surface, we’re seeing signs of a looming proxy war between Chinese tech giants, with expected local casualties through collateral damage. Alibaba made its big entry into Southeast Asia through its Lazada purchase, Jack Ma’s biggest international acquisition to date. Its ongoing tour-de-force has led many local e-commerce players to join forces (e.g. Orami) or throw in the towel (e.g. Ascend Group). JD entered Indonesia organically in 2015 to test the waters and it is now said to be in talks to invest millions into Tokopedia. All this follows the news of Tencent, JD’s biggest shareholder, leading the recent $1.2 billion investment into Indonesia’s Go-Jek, valuing the on-demand motorbike startup at a massive $3 billion. With an Alibaba camp (Lazada), a Tencent fraction (potentially Tokopedia, Go-Jek, and Shopee), and Didi Chuxing, there’s room for one more Horseman in Southeast Asia. But it won’t be a Chinese company, the fourth Horseman in Southeast Asia is either going to be Facebook or Google, with my bets on the social media giant. The rise of e-commerce in Southeast Asia is eating into Google’s lucrative product searches. Post-Alibaba acquisition, Lazada is set to replicate Tmall’s ad monetization strategy.It has already started recruiting for its Marketing Solutions team as seen from job postings on its site. Survey data from ecommerceIQ for Indonesia shows 57% of users start their online shopping journeys with product searches on marketplaces like Lazada and Tokopedia, bypassing the Google tollgates. Why Southeast Asia? Not for the obvious reasons. However, the main reason is that Southeast Asia–and with Southeast Asia, I mean emerging Southeast Asia (i.e. Thailand, Indonesia, and Vietnam)–is very similar to China about 10 years ago. This is especially true when we look at aspects like prevalent business models, digital advertising landscape, and mobile adoption. Whereas US companies’ de facto way of monetization is advertising, Chinese firms have historically looked at commerce and transactions as a way to generate revenues. The poster child for this is of course Tencent. In 2016, only 18% of Tencent’s revenues came from advertising, up from 9.5% a decade earlier. 71% of Tencent revenues came from value-added services (VAS), driven by online gaming, virtual goods sales, and digital music downloads. Compare this to Facebook, who generated 98% of its revenues from advertising in 2016. Another more recent example is Quora, the unicorn Q&A app now worth $1.8 billion after its latest $80 million funding round. After 8 years, the best Quora could come up with are intrusive, text-based contextual ads that were pioneered by Google in…2003. “Users who are knowledgeable about a particular topic can set a price, usually between 1-500 RMB for their answers and get paid for answering questions from others. If they don’t reply within 48 hours, the money will be reimbursed to those who raised the questions. Internet adoption in China and emerging Southeast Asian countries didn’t reach critical mass until the mid-2000’s. These markets skipped most of the Web 1.0 and “Web 1.5” booms and jumped straight into Web 2.0, resulting in digital content creation happening mainly on closed social media platforms like Facebook or on vertically-integrated portals like Sina and Sanook. Unlike in the US, there aren’t millions of long-tail websites and blogs that form the basis for the many ad networks and programmatic advertising. To make things worse, closed platforms like Facebook and portals like Sina sell most (if not all) of their ad inventory direct to consumer, bypassing exchanges for higher margins. We call this phenomenon a “No-Tail” ecosystem. The aforementioned lack of quality ad inventory has led advertisers to buy directly on big portals and closed systems like Facebook. As a result, the lack of demand for ad networks like Google Display Network in Southeast Asia has suppressed RPM rates (revenue per 1,000 impressions) for local ad networks, providing little incentive for content creators. In turn, content creators have found other ways to monetize. In Southeast Asia, peddling merchandise to your Facebook and Instagram audience has been one of the most popular and lucrative ways to make money. In Thailand, this has led to estimates of 33% of e-commerce GMV coming from social commerce. In China, content creators are leveraging WeChat and increasingly live video apps to sell merchandise and generate revenue off virtual goods transactions. Meanwhile, in the US, the de facto ways for bloggers to make money is still to create content and monetize through AdSense and affiliate marketing. The other striking similarity between China and emerging Southeast Asia is that both are mobile-first and in some areas mobile-only. Granted, some coastal areas in China developed pre-mobile era but given the size of China, many people are still coming online and these are mobile-first or mobile-only. 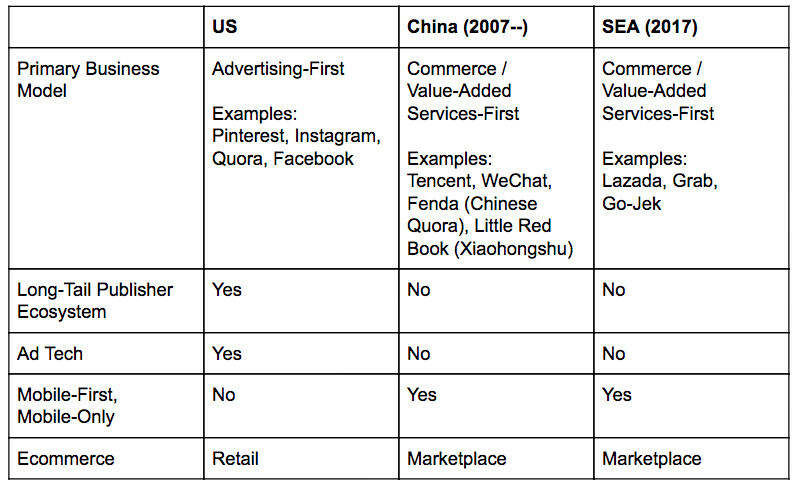 Unlike in the US, new startups in China are frequently building for the mobile user first then later expanding to desktop users. Fenda started out on WeChat followed by its own apps and website while Toutiao started out as an app. In Southeast Asia, e-commerce players like Lazada already see over half of their orders coming from mobile. Indonesia’s BaBe, the country’s leading news aggregator app backed by China’s Toutiao, followed a similar path to its majority investor by taking a mobile-first approach. All of these ecosystem similarities mean that Chinese companies entering Southeast Asia will have a higher chance to succeed. It’s not the first time that Chinese BATs have ventured abroad, winding up with mixed results. Baidu announced its international expansion plans as early as 2006, launched in Japan with Baidu.jp in 2007 then later shut it down in 2015 after a lack of traction. This time around, Alibaba, Tencent and perhaps Didi Chuxing are hopefully smarter and are more confident playing on familiar grounds–Southeast Asia. Is Google partnering with Tencent for its China comeback?